Sybil Shane painted original art inspired by Japanese culture and the Northern California foothills where she lived. By her collaboration over the years with fine artists and designers Tara Sullivan and Miyu Tamamura, her style lives on. The original artworks are reduced in size, reprinted and mounted with matte, glass and black tape for ready-to-hang wall art...or pop them into frames. Prints are titled, matting will be ivory to off-white and vary by collection. 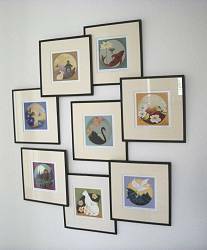 This is a beautiful way to hang several Sybil Shane prints on your wall...overlap them! It gives you a dimensional art piece. Shown are 9" square taped prints. The "top" layer pieces are hanging from nail that can extend out from wall a little more than the picture-hangers holding the "under" layer. 6x12 print, taped under glass and ready to hang. From the "Sacred Zodiac" series. Exposed image under matte is approximately 3.5x8 inches. Sagittarius, November 23-December 21. On the back, "Honest and jovial, Sagittarius is the archer whose arrows never miss their mark. It is the higher mind bent on discovering all the Universe can contain. A benevolent teacher." Read about what others think of Sybil Shane Studios prints and cards! Instead of reviews for a specific product, this is a place to share about the designer line in general.